Spartan™ Omega™ AR500 Body Armor . Constructed from lab certified AR500 Omega™ Armor, (1/4" thickness) these chest plates provide the operator with Level III protection IAW NIJ0101.06 standards. With all of our Spartan™ Omega™ AR500 Body Armor products, we only use ballistic LAB CERTIFIED AR500 steel! All purchases of our Spartan Armor products have current lab certificates available on request. Remember, not all body armor is created equal! Read our "FAQ" to find out more about Spartan™ Omega™ AR500 Body Armor and the steel we use to construct our body armor! You have the choice of getting our Spartan™ Omega™ AR500 Body Armor formed on a continual radius die. Or with our Advanced Triple Curve ™. Instead of bending our formed plates in 2 different locations as we used to, we have machined custom tooling to give these plates a nice curvature to best conform to the side of your torso. Spartan Armor Systems™ is proud to be the FIRST in the industry to commercially offer triple-curved Spartan™ Omega™ AR500 Body Armor. Spartan Armor Systems’ ATC™ body armor allows the operator to shoulder their weapon with the most freedom and limited discomfort. The ATC™ armor better “hugs” the operator’s body, resulting in a significant increase in comfort. Our CNC equipment capabilities have allowed us to create dies which form our body armor without any “crease” bends. Crease bends, “work hardens” the plate and causes a significant amount of stress to the portion of the plate under load. We HIGHLY suggest when doing research to ask if they crease bend their body armor. This process results in increased potential for plate fatigue and failure, which is why Spartan Armor Systems™ has gone the extra mile to create this die process. These plates come as a pair. We are excited to announce our potentially “life saving” breakthrough! The strike face for our plates is mark embedded with our Spartan logo! Both sides of these plates are coated, however, the back side only has a “courtesy coat” to protect against wear and rust. The front of the plate is lined with 1/4-3/8 of our proprietary coating, Encapsaloc ™. The result is a plate approximately 1/2-5/8” total thickness. See our FAQ for more information about our Encapsaloc ™ process. By purchasing, you will receive (2) Formed Spartan™ Omega™ AR500 Body Armor 10″x12” chest plates. Due to popular demand, we have added a “base coat” only option for our AR500 Omega™ armor products. The base coat option has an extremely thin layer of our fragmentation mitigation coating to aesthetically enhance the plates, and to provide corrosion resistance. This coating has minimal, if any, fragmentation mitigation capabilities. 10x12 Plate: Base Coat 8lbs 10oz. Full Coat 9lbs 11oz. 11x14 Plate: Base Coat 10lbs 1oz. Full Coat 11lbs 6oz. Side Plate Weight (per plate): 6×6 approximately 2lbs 1oz (base coat) 2lbs 15oz (full coat), 6×8 approximately 3lbs 10oz (base coat) 3lbs 14oz (full coat). With our Spartan™ Omega™ AR500 Body Armor Advanced Triple Curve™ , the operator now has increased comfort. 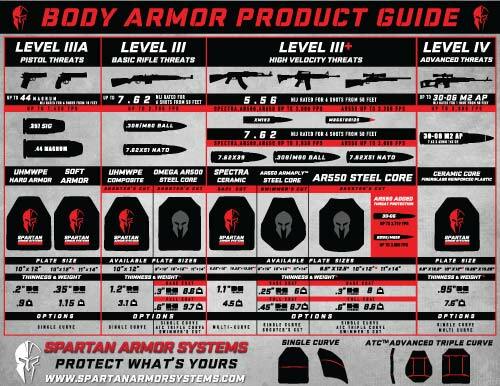 The Spartan™ Omega™ AR500 Body Armor, cut from genuine lab-certified Omega Armor, offers advanced Level III protection. We’ve taken everything in to consideration, to include ergonomics, functionality, and price point. Level III and IV rifle rated body armor (Rifle Plates) fall under jurisdiction of the Export Administration Regulations (EAR) and International Traffic in Arms Regulations (ITAR), and are subject to the export control laws of the US Government. Export or re-transfer of Rifle Plates by any means to any foreign end user or for any other end use, whether in the US or abroad without written approval of the US Department of Commerce or Department of State is prohibited. The sale, transfer, transportation, or shipment outside of the US of any product prohibited or restricted for export without complying with US export control laws and regulations, including proper export licensing, documentation or authorization, is strictly prohibited and may result in civil penalties and/or constitute a federal crime. Spartan Armor Systems, TK Armor Systems, LLC will not engage in any transaction that requires the illegal export of any products and will not assist directly or indirectly with the illegal export or re-export of any products. *******All products available on this category are sold under and branded under Spartan Armor Systems ™ The Target Man’s /Spartan Armor Systems Spartan™ Omega™ AR500 Body Armor Armor products are manufactured from genuine, lab-certified AR500 ballistic grade steel. None of the products available on this website are sourced from, sponsored or approved by, affiliated with or in any way connected with Armored Republic, LLC.